В сегодняшней почте сошлись два письма - от коллеги из Киева о новых требованиях ВАК Украины (одна иностранная публикация для кандидата наук и четыре для доктора) и от коллеги из Италии, возглавляющего редсоветы научных журналов издательства "Springer". Последнее письмо цитирую. Вдруг кому-то из читателей блога надо опубликоваться, и он (она) готов попробовать свои силы в международных изданиях. Call for Papers for the submission, for the first semester 2013, to the forthcoming next journals issues we are editing with the Publisher Springer. Starting the Spring 2013 submission must be done via the Springer web Editor program, following the procedures for submission, rules for authors and referee. We will soon send to all of you detailed information and appropriate instructions for the Springer Editor web submission procedures. This is a great step on the way to upgrade and further qualify scientifically our Journals. 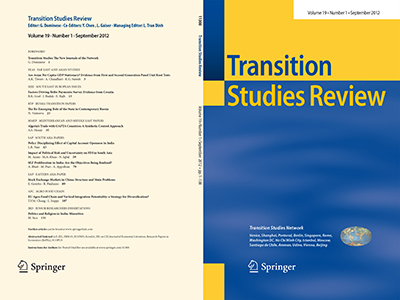 In the Springer Website links you will find the Bodies and Organs, together with the Rules for Authors and information on Transition Studies Network.